We do this by building relationship with youth and inviting them to participate in a consultation process that has them identify the key issues that are affecting their lives and the lives of youth in their community. They are also asked to come up with what they see as solutions to these issues. Youth begin forming a group that will meet regularly and commit to active participation. A 3 day Me Power Process (facilitated as a residential camp) begins the journey of personal empowerment. The process builds self-efficacy, personal agency and confidence of individual youth to make their own informed decisions and take action towards the goals that are important to them. Personal development leads to the identification of interests, strengths, abilities, personal goals and practical steps towards achievement of individual and group goals. This is also where we begin our conversations around SRH and invite youth to complete a confidential self-assessment on their own sexual health. Peer group formation and participation provides a platform for co-operation, support and joint action to address barriers to access services and to challenge gender inequality. 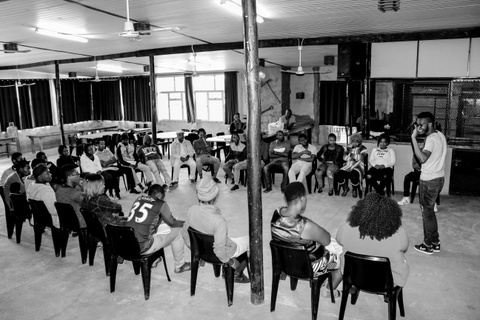 Weekly meetings that are youth led, with inputs from dlalanathi allow youth to have fun, to engage in conversations that are critical to their sexual health and wellbeing as well as focusing on healthy relationships. Our goal is to harness the peer group context to provide a space for young people to positively support and care for one another and to consolidate accurate information concerning their SRH&R, and to share this with other youth. During their weekly group meetings youth spend time with a personal buddy reflecting on personal goals, steps taken, success, obstacles or barriers along the way, and support needed. Group goals are also set allowing youth to take action in their community through youth led events that are creative, participatory in nature and address common issues affecting youth. This positive mobilization of youth in the community begins to change the perceptions of youth who begin to be seen as an asset and resource for positive change. Family communication, a parent/family education program improves parent led communication with youth on issues related to SRH&R. Youth are also supported to achieve their goals, delay sexual debut and access SRH services when they can communicate with their parents on issues related to SRH&R. Increasing youth participation within key structures in the community aims to increase access to services for vulnerable youth. This youth participation aims to sensitize key community stake-holders teachers, nurses and community leadership and key institutions such as clinics and schools to influence SRH services to become more youth friendly to create every opportunity for youth to take responsibility for the sexual health.